TPN’s Vacancy Survey provides some insight, indicating that demand for property outstrips supply at national levels. Landlords and property managers point toward a combination of strong to average demand (96.62%) vs a softer response on the strong to average supply side (79.89%). 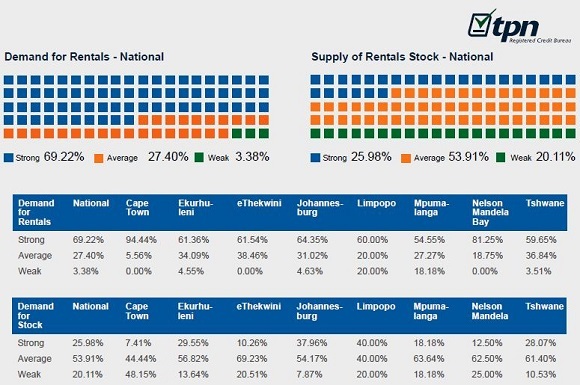 Regionally Cape Town has the most evident disparity between supply and demand which helps explain the double digit escalations this area is enjoying. Nationally the TPN Vacancy Survey points to a vacancy rate of 6.05% for Q2 2016, which is slightly less than the 7.82% in Q1. Properties in the lower income bracket, those below R3,000 per month have a vacancy rate of 4,87%. The affordable property market in the R3,000 to R7,000 range has a 4.48% vacancy rate and the R7,000 to R12,000 range have 6.11% vacancies. There is a notable increase in vacancies to 14.82% in the upper market, comprising properties in the 12,000 – R25,000 range.